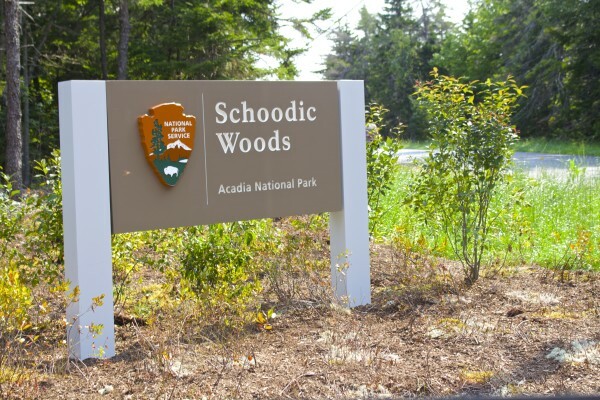 A sign marks the entrance to Acadia National Park's Schoodic Woods Campground in Winter Harbor, which opened Sept. 1. 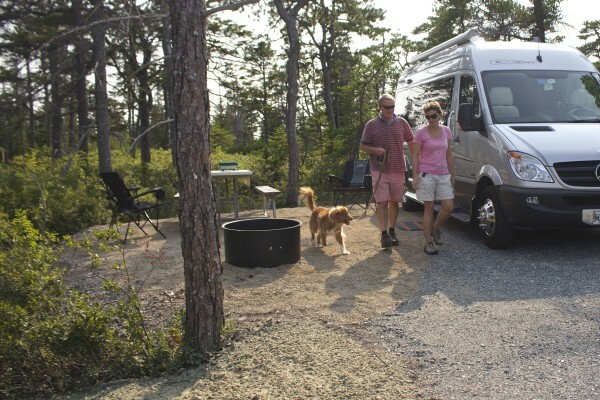 Dave and Jan Reed, who spend their time at campground between Maine and Florida, take a break after setting up camp at the new Schoodic Woods Campground on Sept. 1 at the Schoodic Head Peninsula division of Acadia National Park in Winter Harbor. The campground and nearby trails opened to the public that day. Polly and John Rand of Cornish, New Hampshire, check out the 8.5-mile network of new bike paths at the Schoodic Head Peninsula division of Acadia National Park in Winter Harbor on Sept. 1, the opening day for the Schoodic Woods Campground and the bike paths. John and Loren Wright of Woolwich leave their campsite at the Schoodic Woods Campground on Sept. 1, with their dog, Bella, to check out some nearby trails. The new campground, located in the Schoodic Head Peninsula division of Acadia National Park in Winter Harbor, opened to the public for the first time that day. Bridgette Bloss (from left), Mike Whicker and Shaye Whicker of Indiana set up camp on the opening day of the Schoodic Woods Campground on Sept. 1 in the Schoodic Head Peninsula division of Acadia National Park in Winter Harbor. The family heard about the new campground from a restaurant owner in Freeport and decided to check it out. A hiking trail near Acadia National Park's Schoodic Woods Campground traces the ocean shore in Winter Harbor. The campground, as well as approximately 4 miles of hiking trails and 8.5 miles of bike paths, opened on Sept. 1. A hiking trail near Acadia National Park's Schoodic Woods Campground traces the ocean shore in Winter Harbor. The campground, as well as approximately 4 miles of hiking trails and 8.5 miles of bike paths, opened on Sept. 1, with a grand opening celebration the following day. 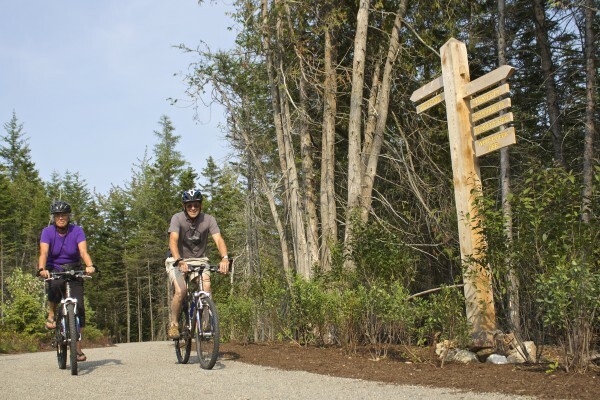 Campers, bicyclists and hikers entered the gates of Acadia National Park’s new Schoodic Woods Campground for the first time on Sept. 1 to explore the new campsites and trails nestled in the mossy woods of Winter Harbor. The Reeds were among the first campers at Schoodic Woods on Sept. 1, registering just after noon for a spacious pull-around campsite on Loop A. There they hooked up their 27-foot camper, set out two chairs and rolled out a carpet beside the composite picnic table. Conifer trees surrounded the campsite. And on the margins of the campground roads, wildflower and grass seeds already had been sewn and seedling trees buried in biodegradable containers. Settled into their campsite, the Reeds were just getting ready to go for a walk. Along with the new campground, 8.5 miles of new biking paths and 4 miles of new hiking trails opened Tuesday. While the soft opening for the campground and trails was Sept. 1, the grand opening celebration was set for 3 p.m. Sept. 2. Open to the public, the event includes a ribbon-cutting ceremony with remarks by U.S. Sen. Angus King, Acadia National Park Superintendent Sheridan Steele and Schoodic Institute President and CEO Mark Berry. The campground opens for self-guided tours starting at 3:30 p.m., and the event concludes with a presentation about the Schoodic Institute at the new amphitheater at 4:30 p.m.
Acadia National Park is home to two other campgrounds: Blackwoods Campground and Seawall Campground on Mount Desert Island. Both campgrounds are on the National Register of Historic Places and were originally constructed by the Civil Conservation Corps in the 1930s. 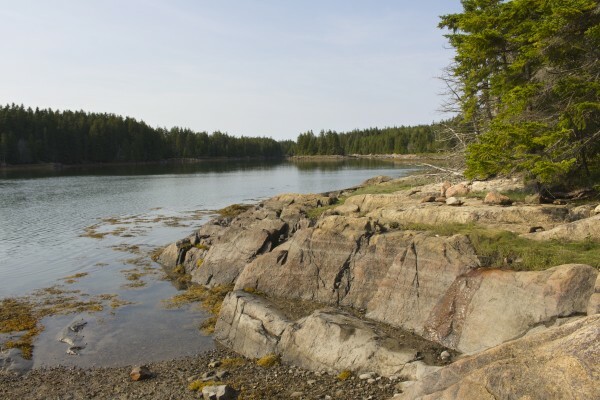 The new Schoodic Woods Campground is located in the park’s only mainland division in Winter Harbor on a conservation easement that recently has been added to the park. It’s opening is the culmination of a decade-long effort to protect a 3,200-acre tract of land on the peninsula, which has been threatened by the development of a resort, including a hotel, golf course, sports center and luxury villas, according to a recent news release issued by the National Park Service. 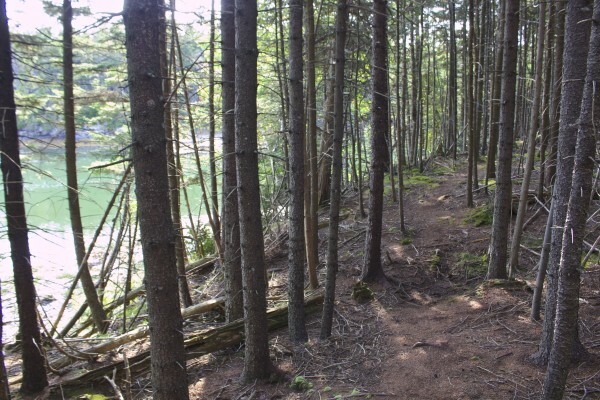 In 2011, Schoodic Woods LLC, a subsidiary of New Hampshire-based Lyme Timber, purchased the land. Over the past two years, the company constructed the campground along with a network of bike paths and hiking trails on the southern half of the property. The company then donated the 1,400 acres of the land — including the campground, bike paths and trails — as a conservation easement to the United States. The land and the new facilities now will be operated and managed as a part of Acadia National Park. In a fairly secluded campsite of Loop B, the three erected a large tent, which they’d nicknamed “The Taj,” and were planning on following one of the new hiking trails to the ocean. “I wanted them to experience this — the smell of the pines, the fresh air,” said her partner, Mike Whicker, the only one of them who had visited Maine before. The campground consists of 94 sites: 33 RV sites with water and power hook-ups, 50 drive-in tent sites with power hook-ups, nine hike-in sites and two group sites with a shared picnic shelter. Other visitor facilities at the campground include a ranger station, a 100-seat amphitheater and a 100-space day-use parking area. The walk-in campsites will be open to campers next summer, Kelly said. For the remainder of this season, which lasts until Columbus Day, only a select number of the drive-in campsites on Loop A and B are available to the public on a first-come, first-serve basis. 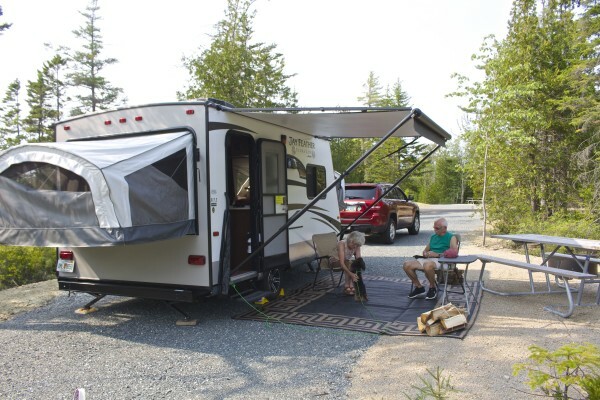 Next summer, people will be able to reserve sites online at the campground at recreation.gov, where Acadia’s Blackwoods and Seawall campgrounds also are listed. Loren Wright was camping with her husband, John Wright, and dog, Bella, in their Mercedes-Benz camper van, which was complete with a full bath and refrigerator. The couple booked the campsite until Friday and planned to attend the grand opening celebration Thursday. Limited parking will be available at the campground for the grand opening celebration and campground tours on Sept. 2. 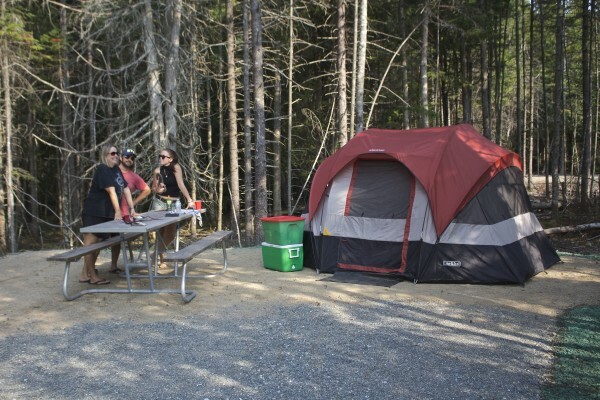 The campground parking area is on Schoodic Loop Road, about 1 mile south of Route 186 in Winter Harbor. Satellite parking will be available at the Masonic Lodge and Winter Harbor Town Office on School Street in Winter Harbor. The Island Explorer will provide free, continuous shuttle service between the satellite parking and campground from 2:30 to 6:30 pm. To learn about Acadia National Park and the new Schoodic Head Campground and biking and hiking trails, visit nps.gov/acad/ or call 288-3338.